Figure 1-11 Main landing gear. conventional type. The tricycle gear is more stable during ground operations and makes landing easier, especially in crosswinds. It also maintains the fuselage in a level position that increases the pilot’s visibility. Nearly all Navy aircraft are equipped with tricycle landing gear. 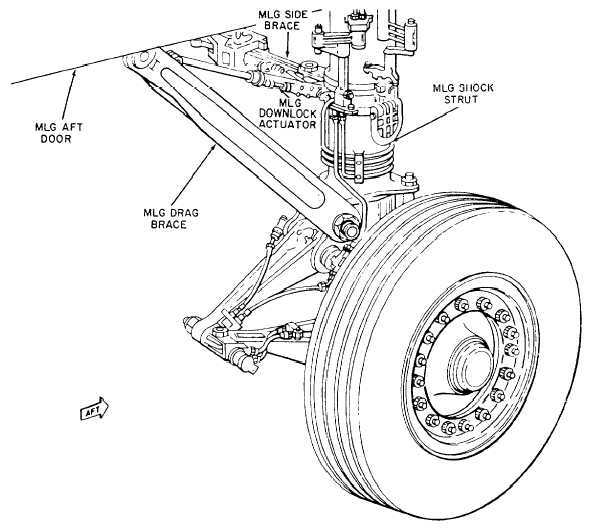 A main landing gear assembly is shown in figure 1-11. The major components of the assembly are the shock strut, tire, tube, wheel, brake assembly, retracting and extending mechanism, and side struts and supports. The shock strut absorbs the shock that otherwise would be sustained by the airframe structure during takeoff, taxiing, and landing. The air-oil shock strut is used on all Navy aircraft. This type of strut is composed essentially of two telescoping cylinders filled with hydraulic fluid and compressed air or nitrogen. Publié dans AERONAUTICS, AIRCRAFT, AIRFRAME, CAEA et BIA, ENGINEERS, ICAO levels, Land., NEWS, READ, Sc. & Tech.